Ameller, D.; Galster, M.; Avgeriou, P.; Franch, X. Quality attributes (QA) play a fundamental role when architecting software systems. However, in contrast to QA in traditional software systems, the role of QA when architecting service-based systems (SBS) has not yet been studied in depth. Thus, we conducted a descriptive survey to explore how QA are treated during the architecting of SBS. Data were collected using an online questionnaire targeted at participants with architecting experience. Our survey shows that QA and functional requirements of SBS are mostly considered equally important. Also, QA are usually treated explicitly rather than implicitly. Furthermore, dependability and performance appear to be the most important QA in the context of SBS. Our results partially show that general findings on QA also apply to the domain of SBS. On the other hand, we did not find a confirmation that QA are primary drivers for the architecting of SBS, or that certain application domains would focus on particular QA. Ameller, D. [et al.]. 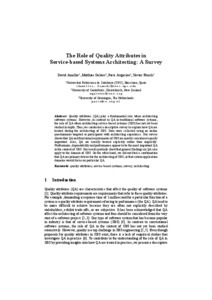 The role of quality attributes in service-based systems architecting : a survey. A: European Congress on Software Architecture. "7th European Conference on Software Architecture, ECSA 2013". 2013, p. 200-207.